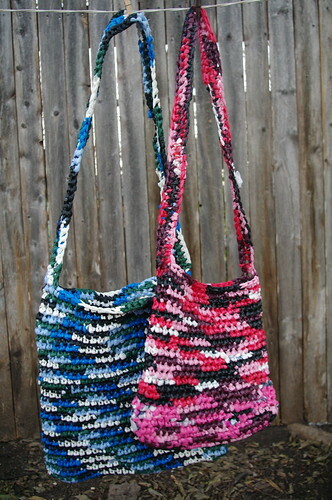 I made a few new crocheted plastic bag bags recently. I gave the pink one to my sister and the blue one to my boss. I usually just string the colors together randomly, but this time I wanted to try something slightly different. So for the blue bag, I tried to be systematic about stringing the colors in a particular order. The resulting pattern looked like plaid diagonal stripes. I think it turned out pretty cool! Karan Rajpal, a student designer for Indian Youth Climate Network (IYCN) in Bangalore, India, just sent me a campaign poster he created using one of my photos. 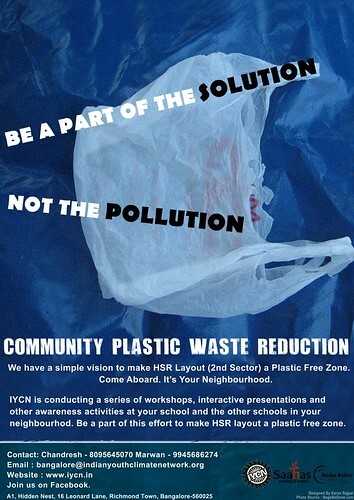 The poster is for a plastic waste reduction campaign that includes workshops, interactive presentations, and awareness actitives for school children. The campaign is in its initial stages and I look forward to following up as it develops. 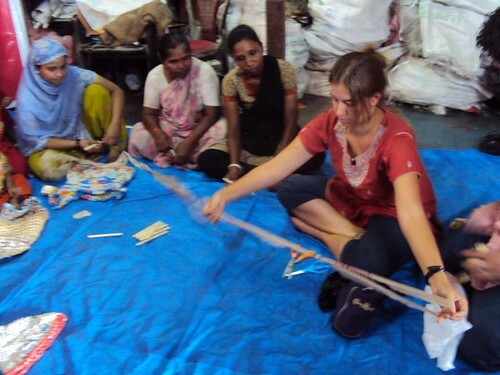 We’ve been in India for a month now and have taught 10 plastic bag crochet workshops! We have also visited several organizations dedicated to recycling and improving the lives of low-income communities. One especially innovative company we visited is Daman Ganga in Vapi, Gujarat. Daman Ganga recycles used Tetra Paks into paper products and roofing sheets. 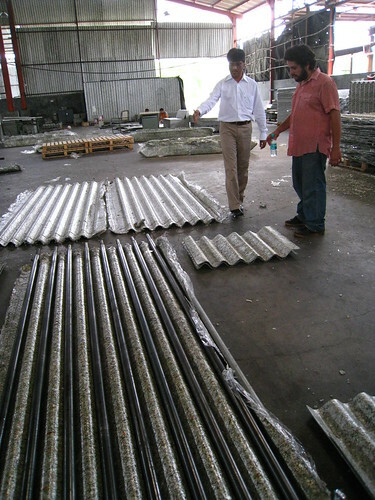 We took a tour of the factory, witnessed the recycling process, and learned all about Daman Ganga’s efforts to provide low-income communities with cheap, durable building materials made from 100% recycled material. I’ll be writing more about this visit soon, but for now…you can visit Daman Ganga’s website and check out our pictures of the factory. Our second day in Mumbai, Miguel and I visited Dharavi (a massive slum recently brought to the world’s attention through the movie Slum Dog Millionare). Here is a National Geographic article about Dharavi – its history, its daily operations, and developers’ plans for its future. It’s interesting and worth reading. 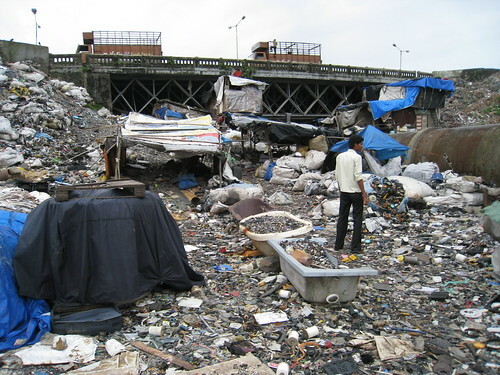 It is estimated that the neighborhoods of Dharavi contribute more than $500 million to Mumbai’s economy each year. These slums contribute to thriving textile, pottery, and leather industries – producing goods that are exported to markets all over the world. 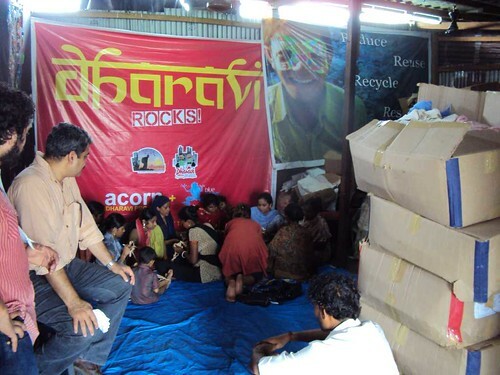 Dharavi also handles large-scale recycling operations. And everywhere you turn while meandering through the slum, you’ll see small manufacturing units sorting and processing the city’s recyclable waste. 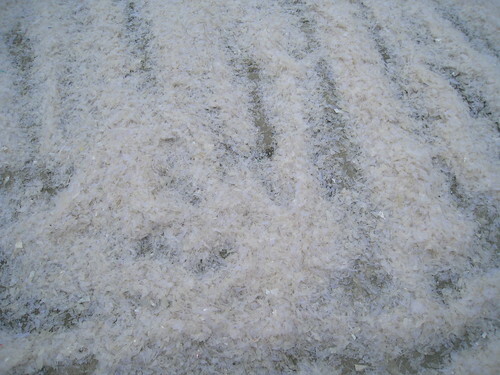 Scrap plastic is sorted by type, cleaned and processed, melted down into tiny pellets, then resold by the kilo. 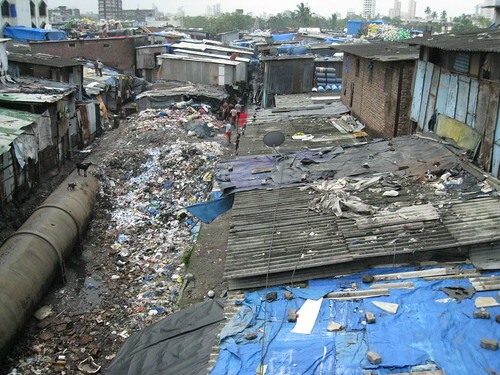 Many of the Dharavi residents have built shacks wedged in between the nooks and crannies surrounding a large pipeline. Their slum villages (often equipped with gas stoves, electricity, and even a TV) are illegal, but because the residents handle the city’s waste management and contribute so much to the city’s economy, officials turn a blind eye – at least for now. But eventually many of these people will be displaced due to a large redevelopment project that is expected to be underway soon. Only legal residents will be compensated for their relocation (but a large part of the Dharavi population is without forms of identification). While visiting Dharavi, we met with Vinod Shetty, a human rights lawyer and Director of the Dharavi Project – an initiative of the ACORN Foundation aimed at improving the lives of Dharavi’s slum dwellers. 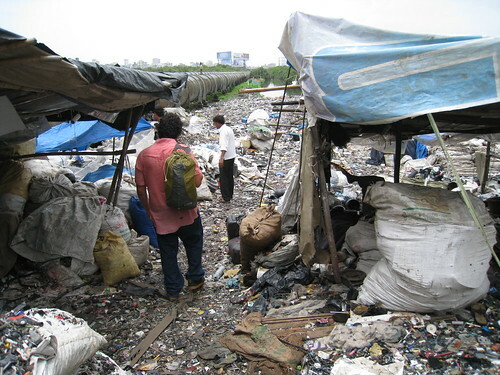 The rag-pickers of Mumbai collect tons of garbage each day, but they are not recognized by the city as a workforce. Instead they barely scrape by, making 75-100 rupees a day by selling the waste to scrap dealers. 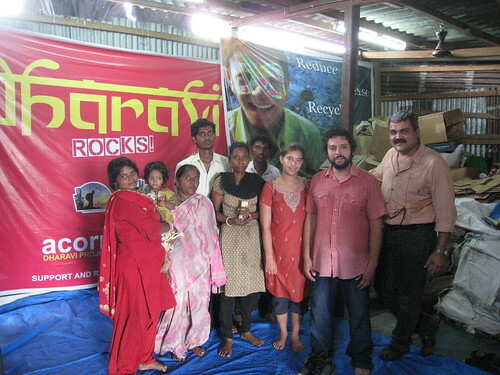 The Dharavi Project’s mission is to “increase the welfare of rag-pickers, and give their profession a legitimate and sustainable voice in the recycling and waste-management value chain at Dharavi.” You can read more about the project here. Vinod has been helping Dharavi residents obtain ID cards so that they can gain visibility by the government and become eligible for city services. 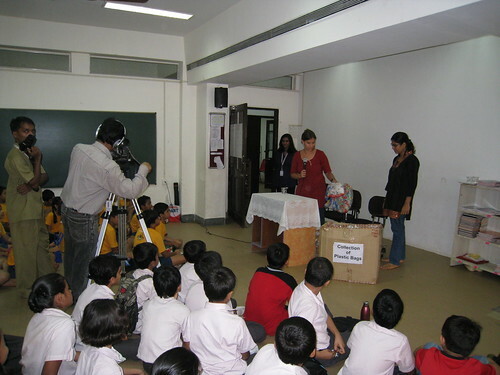 The center also organizes creative projects with Dharavi’s children – children who do not have the luxury of going to school. Instead, they spend their days roaming massive waste piles with magnets to collect scrap metal. 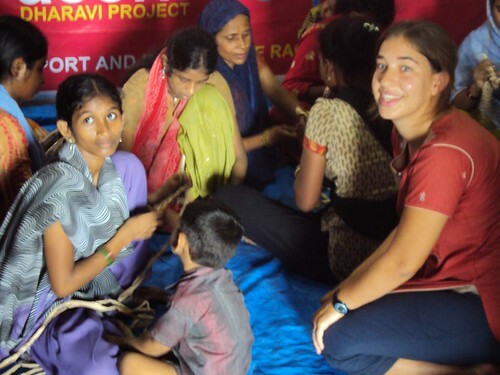 But thanks to the Dharavi Project and various volunteers who have come in to offer their time and skills, the children have had the pleasure of participating in theatre projects, craft activities, and music classes. 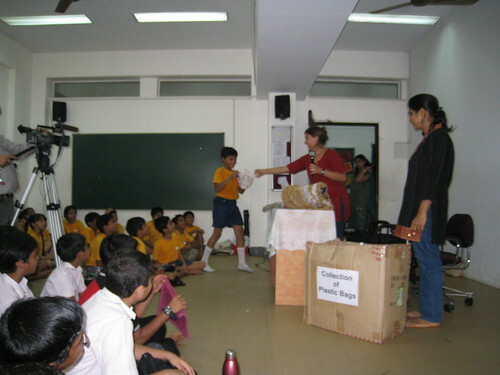 The organization occasionally hosts concerts and events, in addition to their annual Eco Fair. 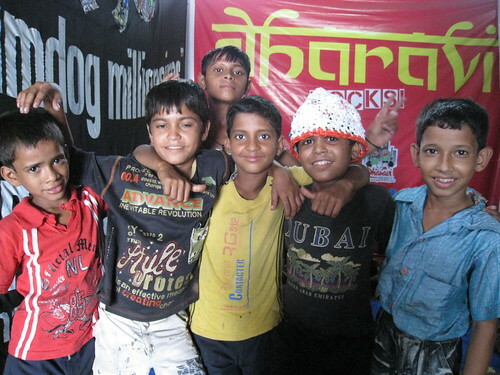 Vinod said the children are recently getting into break dancing and freestyle rapping. He has been inspiring them to write down their songs so they can put on their own performance. When we visited Dharavi, a few of the children came by to discuss the upcoming play they are scheduled to perform in August. 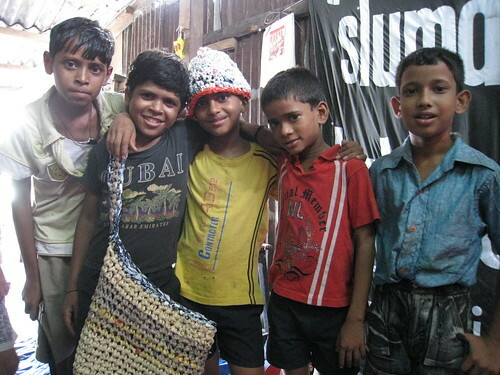 They saw my plastic bag crocheted items and wanted to take a photo with them. After taking us on a brief tour of Dharavi, Vinod rounded up some women interested in learning plastic bag crochet from me. 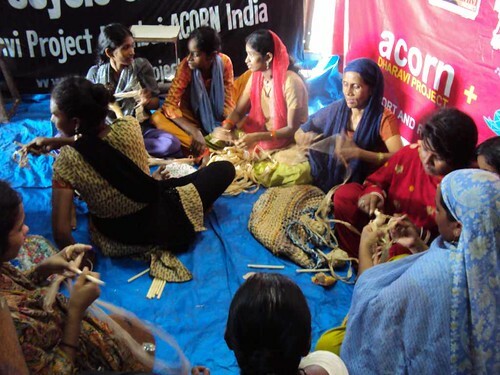 My plastic crochet workshop fit in well with the Dharavi Project’s mission of connecting arts and crafts with the environment. 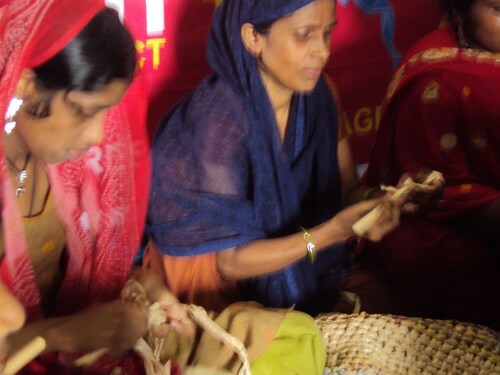 But it also has the added potential of becoming an income-generating opportunity for rag-pickers. My idea was that by showing them this new skill, they may be able to use the discarded plastic bags they already collect to create fashionable bags from 100% recycled materials. 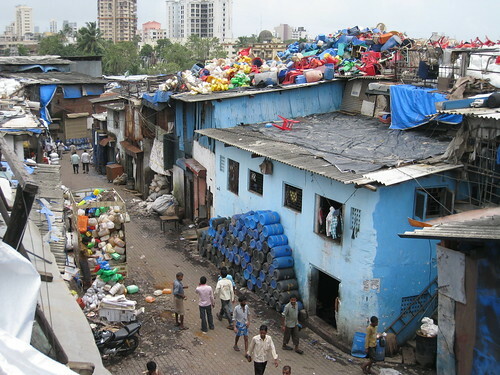 Plastic bags are already collected and sorted at Dharavi. 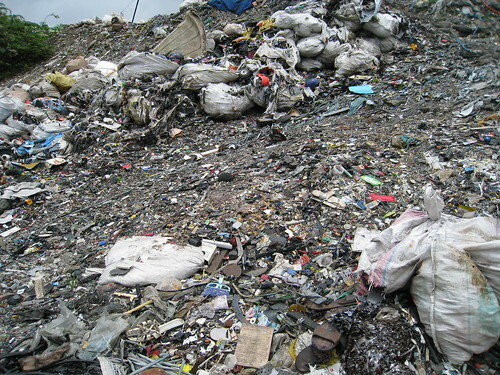 However, rag-pickers generally avoid picking up plastic bags (especially the thin-gauge ones) because it takes so much work to collect a kilo’s worth and the profits generated by plastic bag collection are so minimal. 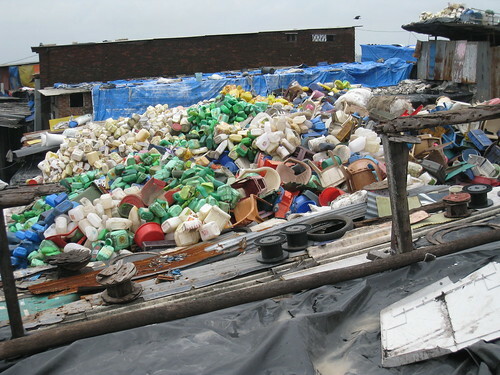 Heavier plastics are more sought after because they have a higher resale value – but regardless, plastic waste collectors hardly make a decent living. 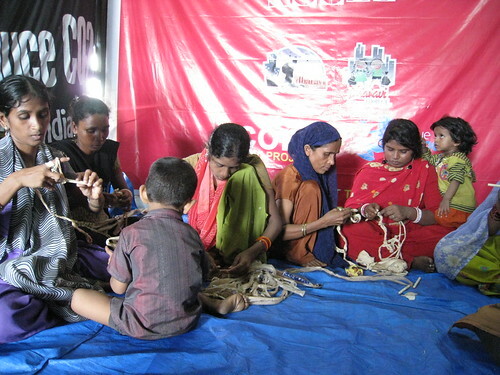 If the rag-pickers are equipped with a new skill (such as plastic bag crochet), they can upcycle the plastic waste into fashionable products to sold locally as well as internationally. The income generated by creating these designer products will ensure that the rag-pickers are paid generously for their time. And in addition to providing an additional revenue stream for impoverished communities, this skill will have an added benefit of cleaning up the city (since more plastic bags will be picked up off the streets). Obviously there are many details to work out before this can be the self sustaining project that I envision, but this workshop was the first step in planting the seed. I’m hoping that by connecting with the right people – people who also care about the environment, the recycling of plastic bags, and the welfare of slum dwellers – I will be able to start the project idea and they can help to move forward with it. The initial meeting worked well. 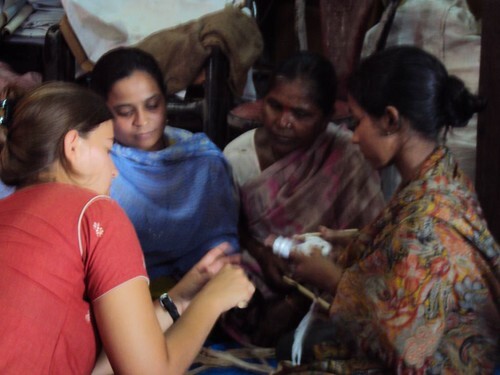 These women don’t care much about environmental concerns – they just care about improving their lives. But they seemed to see the potential this project has in addressing both these issues and were enthusiastic to sit with me and learn how to crochet with plastic bags. 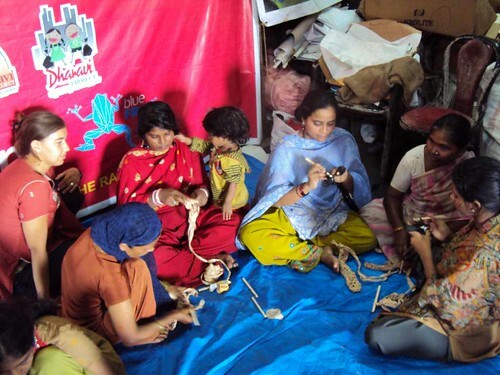 They also really liked the idea of being able to work on handicrafts while sitting comfortably in the office and chatting with each other. I spent a few hours teaching a small group of about 10 women to prepare plastic bag yarn, make the basic “single crochet” stitch, and increase/decrease stitches to create a complete product. I gave them each a large, bamboo crochet hook (which they said they can easily replicate when needed) and I left a stack of hooks in the office in case more women decide they want to participate. The women who attended the workshop said they would each practice, make a small sample, and give it to me for inspection. 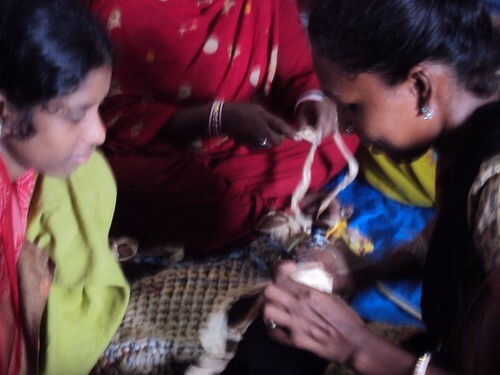 When I returned to Mumbai a week later, I met with Vinod and he gave me some samples a few of the women made. So far so good! I gave him a crocheted shoulder bag to put in the office and use as a sample. 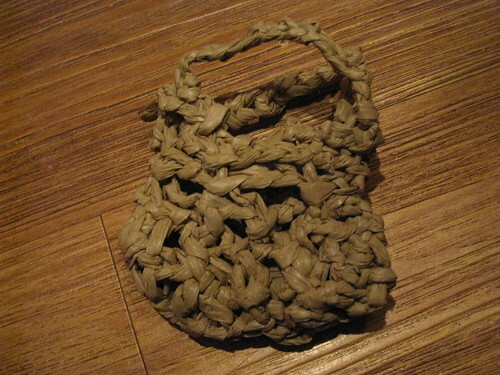 I also provided step-by-step instructions on how to make the bag. Once some of the women make bags, I will buy a batch and try to resell them. It’ll be the first step in seeing if this project can be successful. Sorry I haven’t posted much, but my laptop died and there’s a shortage of Internet cafes in the area we’re currently staying in. Also…we’ve just been extremely busy! In addition to a few impromptu classes, we’ve already taught 7 workshops, appeared on a local radio station, and met with several like minded organizations that share our mission. I’ll write a more lengthy post soon, but you can check out my Events and Workshops page to see a short summary of the events we held this past week. 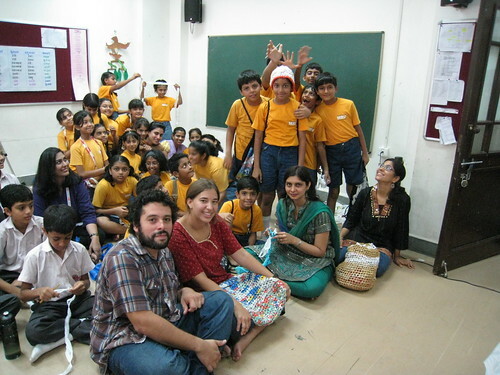 The morning after Miguel and I arrived in Mumbai, we found ourselves in a classroom full of 75 children! 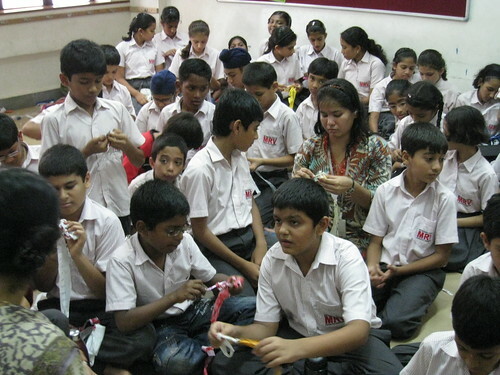 Prior to our arrival, I had lined up a series of plastic bag crochet workshops with several people and organizations in Mumbai. 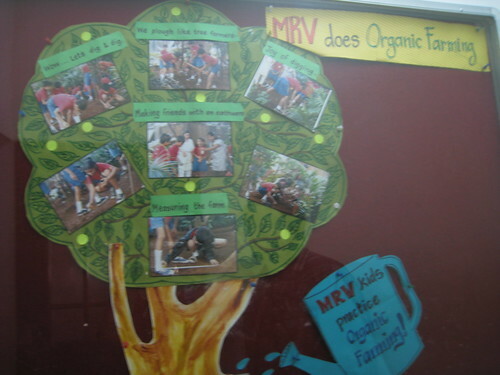 This workshop at MET Rishikul Vidyala (MRV) was the first plan on our schedule. And while I knew I’d be teaching a group of children ages 10-12, I had no idea what to expect. Fortunately, it was a pleasant surprise! I was truly impressed by the school’s organization, the children’s interest in the topic, and the warm welcome we received. Monisha Narke, founder of a volunteer organization called RUR (short for “Are You Reducing, Reusing, Recycling?”), worked with the school to plan the event and picked us up to take us there in the morning. As I was pushed up to a microphone to explain the concept of plastic bag crochet in front of a video camera, I was a bit overwhelmed. But my young audience was silent and attentive. 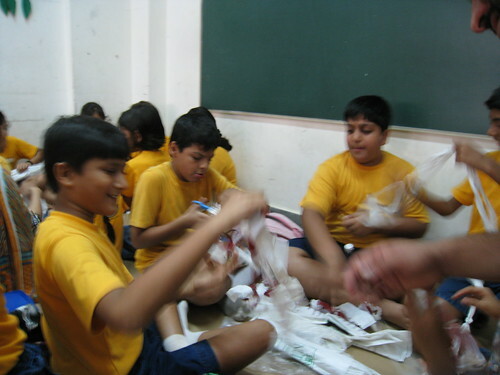 They were interested to learn that we consume about 1 million plastic bags per minute worldwide, that it takes about 100 plastic bags to make a backpack, and that the reusable shopping bag I made will last for many years. As the children passed around some of the crocheted items I brought (such as a laundry bag, shopping bag, backpack, and hat), I could hear oohs and aahs around the room. The hat was a huge hit and everyone wanted to try it on. 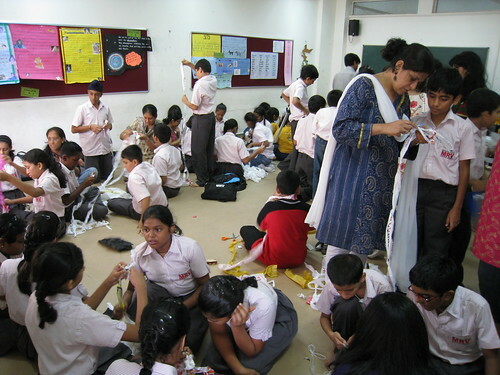 Then they were all eager to learn how to make their own reusable plastic bag creations. 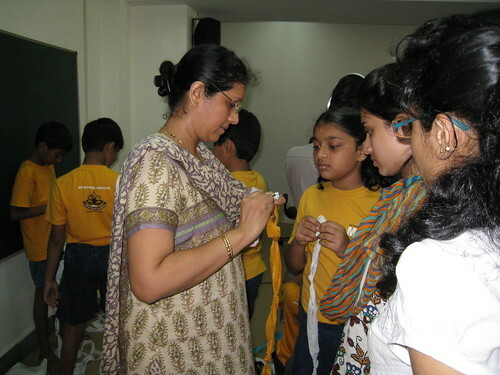 Since last year, Monisha has been working with the children every Saturday on various environmental awareness projects as part of an eco club. So far they have covered topics such as recycling, composting, and organic farming. 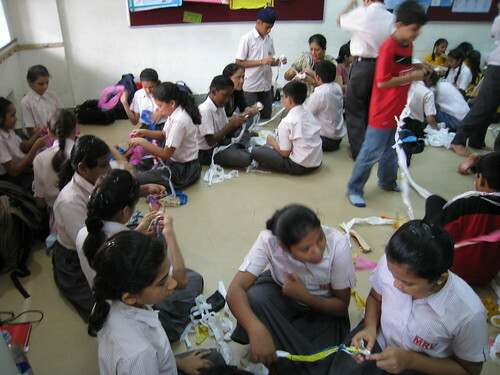 Thanks to this eco club, these young students are wise beyond their years. They now compost all their wet waste, have a thriving vegetable and herb garden, and appreciate the benefits of living sustainably. The students have also organized several beach clean up drives, where they learned (and helped to offset) the detrimental effects of tossing plastic and other waste products into the sea. 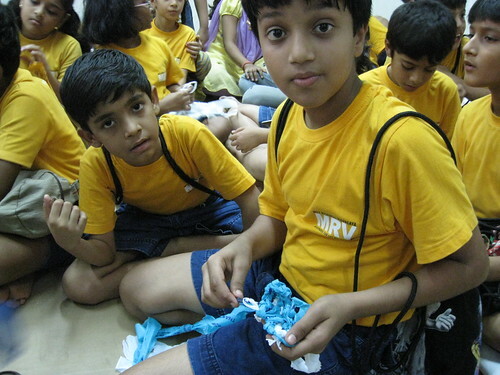 My workshop served as an extension of their knowledge about plastic bag recycling and because it was such a hands-on project, these kids left feeling inspired that they can reuse plastic bags in creative ways. But even though the school knows that their students are smart and inquisitive, the teachers seemed genuinely impressed by how much interest my workshop generated. None of us were sure the children would have large enough attention spans to stay focused on the topic, so we had planned for the event to be more of a demo. 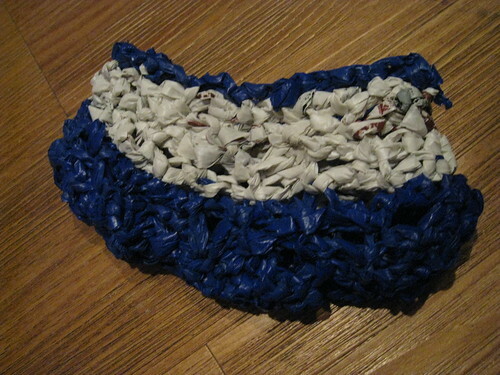 I thought I’d just briefly explain the concept of plastic bag crochet, show them some of the things I made, and use it as a launching point to discuss why we should minimize our plastic bag consumption. 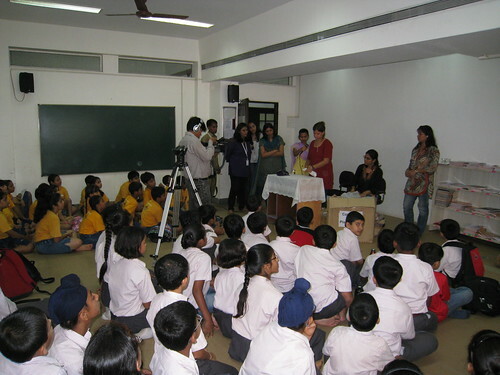 But as it turned out…the kids were extremely enthusiastic. Everyone wanted to learn. And even after the hour was up, I was swarmed with children wanting to continue the lesson. My only regret was that I didn’t anticipate the large turnout and bring enough crochet hooks for every child to have one. Instead, we had to divide them up into groups of five so they could share and take turns, a plan that inevitably turned a bit chaotic since each child was frantic to be the first to learn. And because there were so many of them (and only one of me), it was tough to help everyone at once. 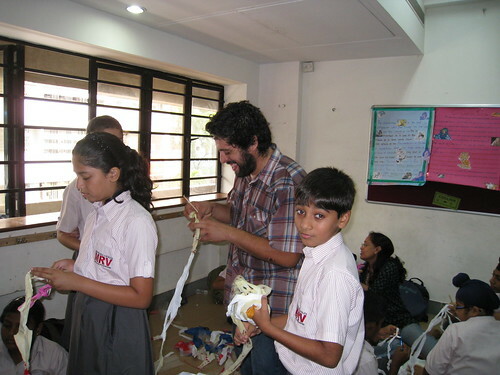 Luckily Miguel and a few of the teachers were there to work with the students as well. It would probably take a few more classes to get all the kids crocheting, but at least the seed was planted and they can pursue it if they choose to. Everyone loved the idea and the learning will likely continue. 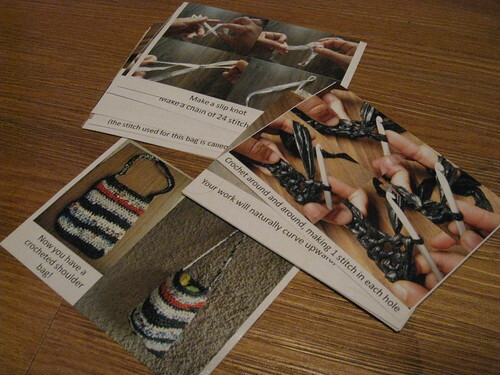 Next week the teachers will pass out copies of the pamphlets Miguel and I made, along with the crochet hooks I will be sending them in the next few days (enough for each student this time). A few of the girls made bracelets, one boy made a necklace for his mom, and another boy made a big, triangle-shaped ring. Several other kids made unidentified creations that they were quite proud of and a few others plan to practice at home so they can make hats like mine. To sum it all up, this workshop was a success and I really enjoyed my time at the school. All the faculty members were amazingly sweet as well. After the class was over, Miguel and I were ushered into the faculty room where we were promptly served tea and a series of sandwiches, croissants, and sweets. 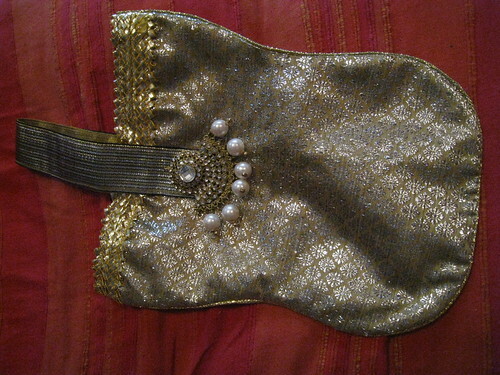 Then Kavita Sanghvi, the Vice Principal, presented me with a beautiful gold bag as a thank you gift from the school. 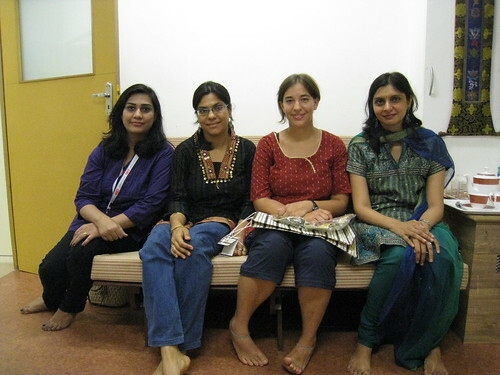 *Many people asked where they can purchase crochet hooks in India. And while I haven’t even visited this store yet, I think I managed to give a lot of business to a craft shop in Bandra called Hobby Ideas. I’ll be looking into places to purchase hooks soon (as I have the feeling I’ll soon be giving away all the ones I collected). Once I learn of places to purchase hooks in Mumbai, I will write a post about it. *I will be writing more about Monisha Narke and RUR in a later post. And I’ll be teaching another workshop at her house on Wednesday, July 13th. But for now, here are a few articles about her organization. *The school had a photographer attend the event and said they’ll send me the pictures. So I’ll likely be posting more pics at a later date. When searching for ways to crochet that don’t require a crochet hook, I came across this video showing someone crocheting plastic bags with their fingers. I tried it out and it worked just fine! Who knew crochet could be so easy? Finger crochet stitches come out very loose and lumpy… so this technique won’t work well if you’re going for the tightly crocheted look. 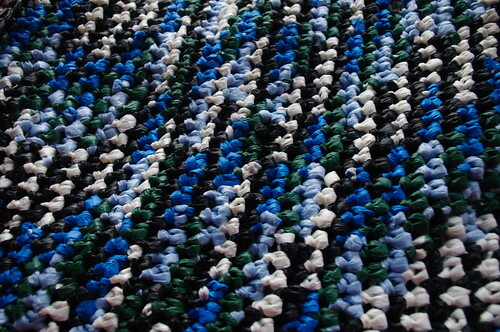 But if you’ve got lots of plastic bags, are without a hook, and want to make a quick chunky crocheted creation (like a rug, a floor mat, or a large net style bag), finger crochet is the way to go! I recently discovered an awesome site called Kickstarter. It’s basically a crowd sourced fundraising platform for creative projects and artistic endeavors. Once the Kickstarter team approves a project, the artist can set a funding goal, timeline, and rewards for different pledge amounts. Then people from around the world can chip in to help fund the project. The money pledged will only be collected from supporters if the project reaches 100 percent or more of its funding goal (so if the goal isn’t reached in the time allotted, the artist gets none of the pledges). I think Kickstarter is a great resource. It’s also a great way of leveraging social media to gain support for creative ideas and offbeat projects – projects that would otherwise have a hard time getting funding from traditional sources. My Kickstarter project just got approved and today is its official launch date! I’m pretty excited and am confident that I can raise the support necessary to meet my funding goal. You can visit my Kickstarter project here. 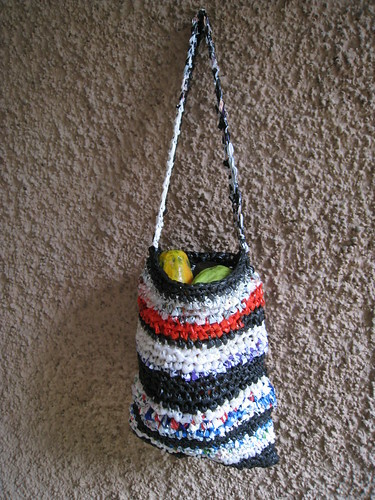 Plastic Bag Crochet in India? 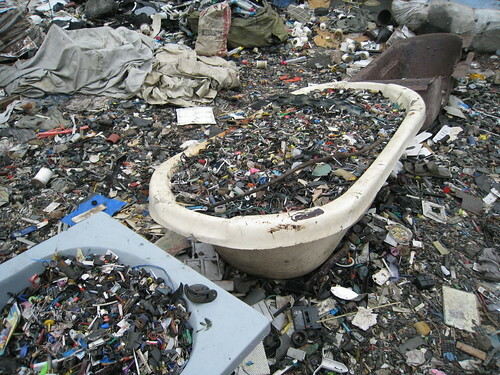 Well, let me back up a bit first. Last year I embarked on a year-long trip around the world. While the trip wasn’t about crochet teaching, I did quite a bit of it during my travels (teaching various impromptu workshops to people in places like Thailand, Vietnam, Iceland, etc.) I wasn’t in any of these countries long enough to do this on a larger scale, but there has been lots of interest in my idea and I’ve always envisioned turning my concept into a self sustaining project – one that shows people they can have a direct impact on reducing waste in their community AND use their new skill to raise funds for improving their living conditions. I recently spent two months in India (Tamil Nadu, Kerala, and Mumbai to be exact) and knew I’d go back someday. Luckily the opportunity to return has happened sooner than I thought and I’ll be back in India this summer (in Mumbai, Gujarat, Rajasthan, and Delhi). I’m eager to see if I can work on a project that combines my interest in teaching crochet, my passion for recycling, and my love for India. Obviously there are a lot of details to work out before anything huge can happen, but this is a start. This particular trip will be about traveling around, teaching plastic bag crochet to whoever wants to learn, and meeting with organizations that are already promoting plastic recycling projects. Once I’ve found an area where I’m comfortable pursuing a larger project and have selected a community that can directly benefit from it, I’ll return for a longer time period to try and make it happen. More details about my upcoming trip here.